As they require higher investment costs compared to compression chillers, sorption chillers can usually not be operated economically unless heat is available at low costs. In order to achieve a positive effect on the CO2 balance, the supplied drive heat must be CO2-neutral. The heat energy should be as cost-effective as possible. he heat supply must be available at the time cooling is needed. To avoid excess heat, the heat supply should be as close to the required cooling energy as possible. he chillers operate with temperature differences between 5 and 10 K, which means that the temperatures for the return into the system (temperatures at the chiller outlet) will be relatively high. he temperature level of the heat source should be between 60 and 150°C depending on the cooling purpose (see illustration). 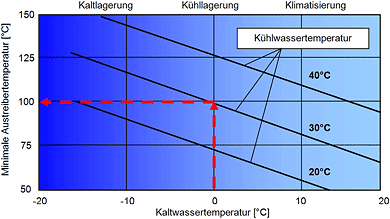 Sample readout (red arrows): A desired cold water temperature of 0°C requires a generator temperature of 100°C at a cooling water temperature of 30°C.